It was our first year to go to Anime North and Fan Expo. A few of my classmates went each year and they had such a great time that they actually inspired me to start cosplaying. When I was in high school I had heard about cosplaying but it seemed like such a foreign idea to me. I didn't know why one of my co-workers went to a convention to dress up as a sailor scout, nor why she was so excited to do it. Now, the idea of cosplaying is so familiar - I would say The Big Bang Theory made it seem almost commonplace. I'm also terrible at acting and imitating voices or accents. Some people have a lot of fun acting out as the characters but I was more into the costume and look. Even though Star Wars isn't technically anime it's characters are embraced at Anime North and I knew that I really wanted to go as Queen Amidala. She was a perfect fit for me, she had elaborate, full bodied costumes, covered her hair often, and it doesn't hurt that she's a queen with handmaidens to boot. My mother in law is fantastic with a sewing machine and embroidery so I knew we could make this happen. So we had a few months and two costumes to make. If you watch the Star Wars prequels Queen Amidala is impeccably dressed but sometimes only on camera for a few moments with the outfit, and then not even moving much so you don't get to see her in a 360 degree fashion. So once I picked out the two costumes I wanted, I scoured the internet until I could find different views of them. Thankfully there was a costume exhibit in the U.K. of the Star Wars prequel that showed Queen Amidala's costumes in all their detail. When I saw some of the backs of these costumes I realized that I had no idea what they looked like from the back at all from the movies alone. The kimono one actually had her hair in a long braid in the back that I would never have known about otherwise. I was surprised to see how much detail in these costumes got zero airtime in the movies considering how much hand work was done. To do all that embellishment to half of a costume and then only view her from the front for a minute seemed like a travesty to me. I watched some commentary on the head costume maker and she said that her favourite costume - one based on a peacock, where she had spent the most time, was actually cut from the film entirely, much to her dismay. Armed with detailed photos, we travelled to the fashion district looking for materials that could come as close to the likeness of these costumes as possible. We found gold embroidery thread, peacock feathers, silk, taffeta, pearls, and lace. Sometimes the fabrics were spot on, but a slightly different colour or pattern, but overall we were looking for the essence of the costume rather than creating an exact replica. My mother-in-law worked relentlessly. She crocheted hundreds of tiny pearl beads together to make one headdress, and incredibly fine gold thread to cover the red buns and the bottom embroidery of the other dress. She had made me a kimono and the most detailed headdress I've ever seen. The pearl one was more elaborate than most wedding dresses. "I actually needed handmaidens to help me." I couldn't even get into the kimono style dress without help. 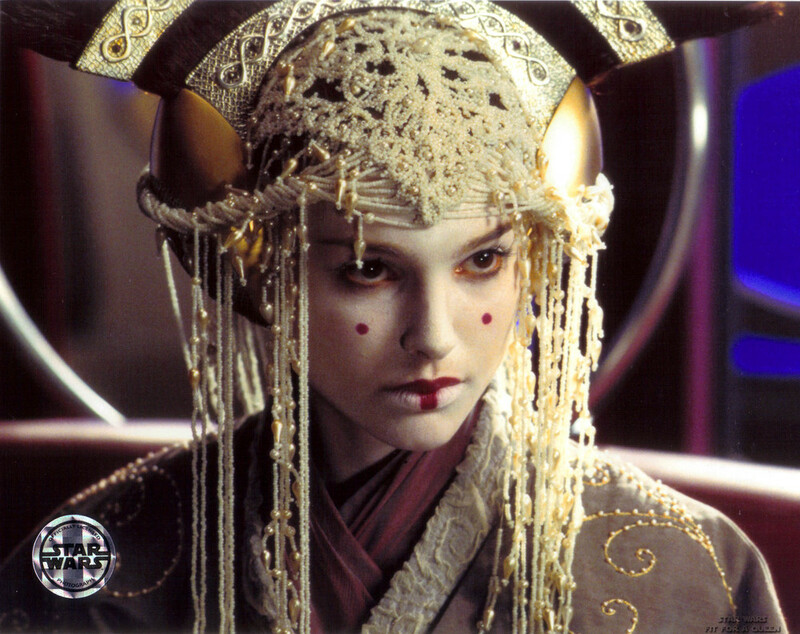 By becoming Amidala, I actually needed handmaidens to help me like she did. Our makeup artist Ellie was the sweetest. She actually became the most helpful "handmaiden" around. She would touch up my make up, and help me collect the feathers that flew out my headdress occasionally. She also carried my purse so it wouldn't ruin my queenly illusion. This picture was my struggle of trying to use the drinking fountain with all my pearls and feathers getting in the way. Both days of these conventions were extremely hot. I was not at my most comfortable wearing so many layers and and beadwork. I didn't really know what to expect when we arrived at the convention. We were actually able to leave the condo without anyone seeing us. I think the thing I had to get used to the most was that I had to take the feather height on my head into account when moving into the car or under trees. I got caught a couple times like some odd bird. With the pearl headdress, I felt like my head was so heavy, it was an actual effort to keep my head up in a more regal position. Some of my favourite moments were when other queens or princesses wanted to take photos with me - Princess Peach and Daisy, Princess Leia, the Queen of Hearts. The Queen of Hearts actually took her sceptor, did a little bit of of a curtsy and motioned to me in approval saying "In appreciation from one queen to another." People would also call to me in the crowd and actually call me Queen Amidala to get my attention. But I think my very favourite was when a little girl of about 4 or 5 shyly came up to us with her dad, and he asked us if we would be so kind to let his daughter get a picture with the queen. We entered a really cool booth at Fan Expo. Mecreo3D called us in because they loved our costumes and wanted to be able to capture the detail in them. One of the girls couldn't stop touching all the embroidery and pearl work. In the booth there were about 60 cameras set up to go off simultaneously and converge into a 3D live image of yourself that could be rotated in every direction. From that you could get a 3D statue made of yourself. It was amazing. I got a blister on my foot that day and it even caught the band-aid so of course it got the pearls and the feathers, as well as the sheen of the silk. Here's a 3D render of my cosplay from the 60 camera set up by Mecreo3D! I didn't expect cosplaying to be so fun and the people there to be so down to earth and excitable. I got to live my day as another character, and people actually treated me as such. It was a very unique experience in such an inclusive environment - it was awesome to see people who all share the love of these characters just like you do and acknowledge your little bit of awesome geekiness because it's in them too. There are still a few costumes from the Star Wars universe that I could do for the next conventions, but after seeing Episode VII, I also kind of want to not be a queen and just be Rey in her goggles and dessert gear where I'm totally anonymous.